We are a fact-gathering organization. We don’t clear anybody. We don’t condemn anybody. 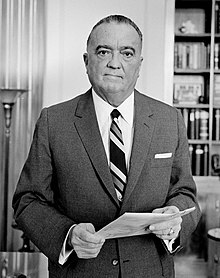 John Edgar Hoover (January 1, 1895 – May 2, 1972) was the first Director of the Federal Bureau of Investigation (FBI) of the United States, appointed director of the Bureau of Investigation—predecessor to the FBI—in 1924. He was instrumental in founding the FBI in 1935, where he remained director until his death in 1972 at the age of 77. Hoover is credited with building the FBI into a larger crime-fighting agency, and with instituting a number of modernizations to police technology, such as a centralized fingerprint file and forensic laboratories. The FBI's current headquarters is named in honor of him. The thousands of criminals I have seen in 40 years of law enforcement have had one thing in common: Every single one was a liar. Lyndon Johnson, as quoted in The New York Times (31 October 1971). I never saw any indication of homosexual tendencies in Hoover.… He did have a close association with [Clyde] Tolson. They conferred frequently during the day and they invariably ate lunch together…. On Wednesday they had dinner at Tolson's apartment, on Friday at Hoover's house.… I know from my talks with Hoover that he was genuinely fond of Tolson, as an older brother might be. W. Mark Felt in The FBI Pyramid from the Inside (1979).